Have you ever wondered how people would keep track of their day-to-day activities before the calendars we use today were invented? Would you believe us if we told you that instead of paper, or even electronics, people used stones that could even determine the fate of one’s civilization? 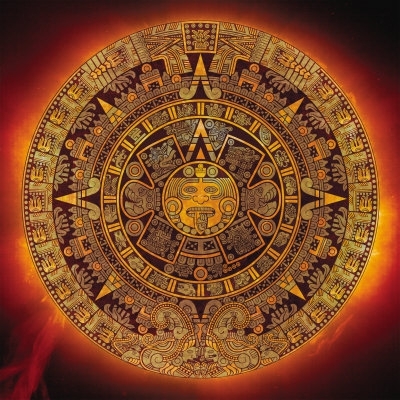 The Aztec calendar was this and much more. This remarkable artifact has existed more than 500 years, carved during the year of 1512 in central Mexico. Over the years, it has informed us of the Aztec culture and their common beliefs. With the Aztec sun god, also known as Tonatiuh, looking out from the center of the cyclic sequence of glyphs and dates, this impressive stone has a diameter of 11.75ft, weighing 24 tons. This work of art was recognized as the epitome of the warrior cosmogony and civilization that occupied the Valley of Mexico. Recognized as Ollin Tonatiuhtlan (Sun of Movement) by the Aztecs, this calendar refers to the era of the Fifth Sun, which corresponds to our present time. And although it is often referred to as a calendar, also bearing a calendar-like appearance, this monolith had been used as a platform for gladiatorial sacrifice, offering the blood and vitality of the warrior to the sun god. Though this artifact was carved in 1512, it was soon abandoned near the Viceregal Palace in 1521 when the Aztec capital, Tenochtitlan, fell under Spanish rule. There it remained for a little under two centuries, founded in December 1790 when renovation works were carried out in the city. This discovery provided proof that the Aztecs were not uncivilized but a sophisticated group of people with a beautiful culture. The permanent location of the Aztec monolith is now the Bosque de Chapultepec at the world known National Museum of Anthropology. Cultures Around the World pursues to explore the legends and all their differences, adding to your adventurous guidebook with some excitement. Stories such as these make up the native land’s art, music, and literature, allowing for one to truly invest in their travel location. As we explore the historical context of these places, we hope to enhance any travel experience! Let us know what you think. Connect with us on Facebook, Twitter, or Google +.